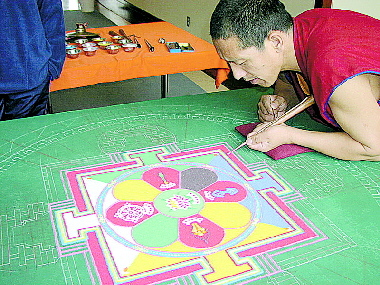 During Honoring Diversity Week 2004, Tibetan Buddhist monks worked an entire day to create a mandala of colored sand. The mandala — which represents the Buddha's body of enlightenment or a "palace of purity" free of spiritual obstacles — is intentionally made of impermanent materials, then deliberately destroyed. At the end of the day, the monks distributed small packages of the sand in a ceremony focusing on compassion. The School of Nursing this week will celebrate and honor diversity through exhibits, demonstrations, performances and forums highlighting art and culture from around the world. Honoring Diversity Week, which allows students, staff and faculty to share their rich diversity and vast experiences of cultures from near and far, also will be marked by the launch of a newly redesigned and enhanced Diversity section on the SoN Web site. This year's event, held in conjunction with Peace Corps Week, is planned by nursing students — many of whom are Returned Peace Corps Volunteers — and the JHUSoN Cultural Competency and Diversity Committee. See Special Events. Wed., March 1, 3 p.m. "University of Rochester School of Medicine and Dentistry," with John Hansen, associate director of admissions. One-on-one individual interviews will be held from 10 a.m to 12:20 p.m. (Sign-up in the Office of Pre-Professional Advising required for individual interviews.) 160 Mattin Center. Thurs., March 2, 1 p.m. "Financial Preparation for Graduate School," with Anita Dinwiddie, JHU, and Mary Cissy VanSickle, Bank of America. Required for all prehealth and prelaw students. Sherwood Room, Levering. Sat., March 4, 10 a.m. "How to Flourish in the MSM Program," a SPSBE panel discussion and networking opportunity for MSM students, with MSM students and alumni. MBA students with a concentration in marketing are also welcome to attend. Room 204, Washington Center. Mon., March 6, 12:15 p.m. "Managing Work and Personal Time," a Center for Communication Programs seminar with Melissa Back Tamburo, JHU; Suite 310, Candler Bldg., 111 Market Place. Mon., Feb. 27, all day. Gallery and display of Africa and the Caribbean. 10:30 a.m. to 1:30 p.m. Food vendors selling food from Guatemala, Tibet and Trinidad. Noon to 12:30 p.m. Kids' break-dancing performance. 12:30 p.m. Lunchtime diversity forum with Barbara Baum. Tues., Feb. 28, all day. Gallery and display of Europe, Asia and the Pacific Rim. 12:30 p.m. Tibetan lamas chanting religious blessings. Wed., March 1, all day. Gallery and display of the Americas and U.S. cultures. 12:30 to 1:30 p.m. International potluck. 12:45 to 1:15 p.m. African Resurrection Dance/Drum group performance. Tues., Feb. 28, 6 p.m. "Audio Effects Primer," with Matthew Sterling. Thurs., March 2, 6 p.m. "Audio Hardware in the DMC," Andrew Cole. Sun., March 5, 5 p.m. "Video Production Techniques," with Leslye James.